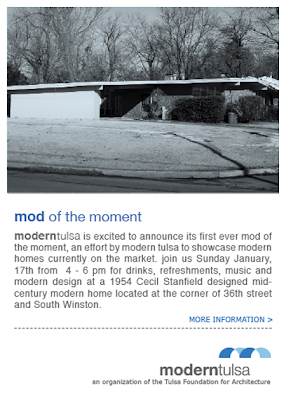 Modern Tulsa has announced an open house event this Sunday, January 17, 2009. This Mod of the Moment event is the first of what we hope will be many! I think this is a really great idea. During the 2008 National Preservation Conference we were fortunate enough to catch a presentation about Houston Mod presented by Anna Mod (and yes, that is her real name). This non-profit group has accomplished some pretty impressive feats. One that really resonated with me was their "Mod of the Month" program. The idea is not just to connect buyers and sellers- it's also about educating real estate professionals to recognize there is a market for these "unusual" houses. Homes are often needlessly "improved" to increase their mass-market appeal. This type of relationship with local realtors is a win-win for our community. It's been a huge success for Houston, hopefully we can capture a little of that magic!